This sarcophagus was founded in the 1920's at an ancient priest burial sight. 2 mummies were found at the sight. The mummy was believed to be a high priest of "Thoth". Supposedly that's what the inscriptions revealed. He was known as one of the "5 priests of Thoth". One of the other mummies was a singer. A bunch of gold artifacts were discovered as well. They had a live show on the findings the other day. Edited by JohnHermes, 10 April 2019 - 08:18 AM. I watched it on Amazon. It may not have been as exciting watching live, but it was great not having to deal with ads. And you could take breaks easier since you could use the pause button and not worry about missing anything. 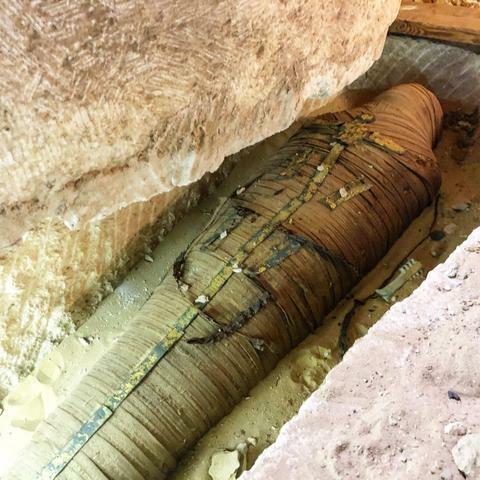 Here's the image of the mummy they found on Sunday, April 7, 2019 show. Edited by MacCionoadha BeanSidhe, 13 April 2019 - 12:19 PM.